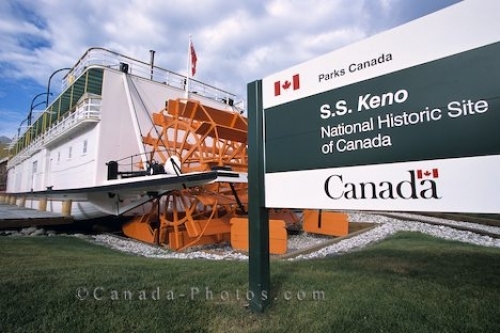 At the National Historic Site in the Yukon Territory, is where the SS Keno riverboat is docked and where you will find information about the boat and its history. The riverboat which is on display in Dawson City in the Yukon Territory in Canada was a success story that helped develop some of the Canadian history. Back and forth in the waters of the Yukon Territory, the SS Keno riverboat went daily carrying minerals during the Klondike Gold Rush. Picture of a historic riverboat known as the SS Keno in Dawson City in the Yukon Territory in Canada.